In the latest string of old hacks coming back to life, microblogging, social network Tumblr, who was hacked in 2013 – has a much larger scope than anticipated. 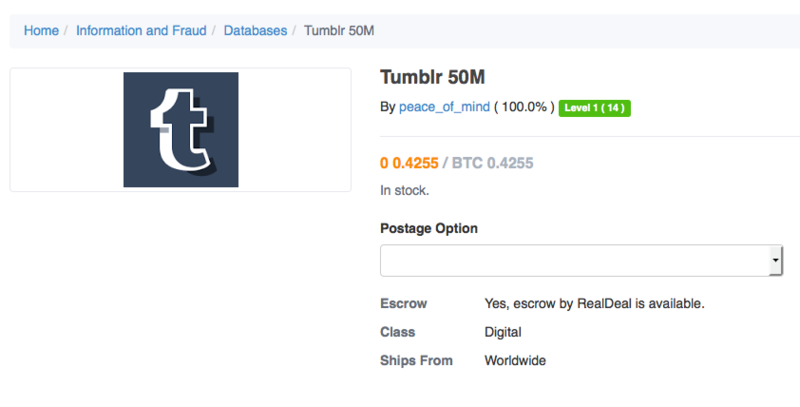 Back in 2013, Tumblr refused to release the number of those affected and now that much anticipated number has finally been brought to light as – 65 million emails and passwords. On Monday, May 30th, Troy Hunt, creator of popular breach notification site HaveIBeenPwnd, released a blog stating that he had just finished uploading the database to the site. [i] Once again “Peace”, the hacker tied to LinkedIn , Linux Mint, and Myspace, seems to be behind this data leak. Since a lot of these database, dark web sales seem to be coming from old hacks, it cannot be confirmed that “Peace” was actually the responsible for the initial breach. However, it is a concerning trend that seems to be only picking up steam. “If this is a trend, where does it end? What more is in store that we haven’t already seen? And for that matter, even if these trends don’t all correlate to the same sources and we’re merely looking at coincidental timing of release, how many more are there in the “mega” category that are simply sitting there in the clutches of various unknown parties?” Posted to Mr. Hunt’s blog, a series of questions that really makes you wonder. So what do you think, coincidence or a disturbing correlated trend?